Both are currently under a commercial lease, held by The Centre for Mindfulness Studies, these spaces are available for rent, through them, for $25 – $30 an hour. In August of 2013 Live/Work Artists received an offer from St. Clares to lease the space “at cost”, an offer that was roundly rejected as it did not meet the requirements of the Section 37 Agreement to see the details of this offer click here. 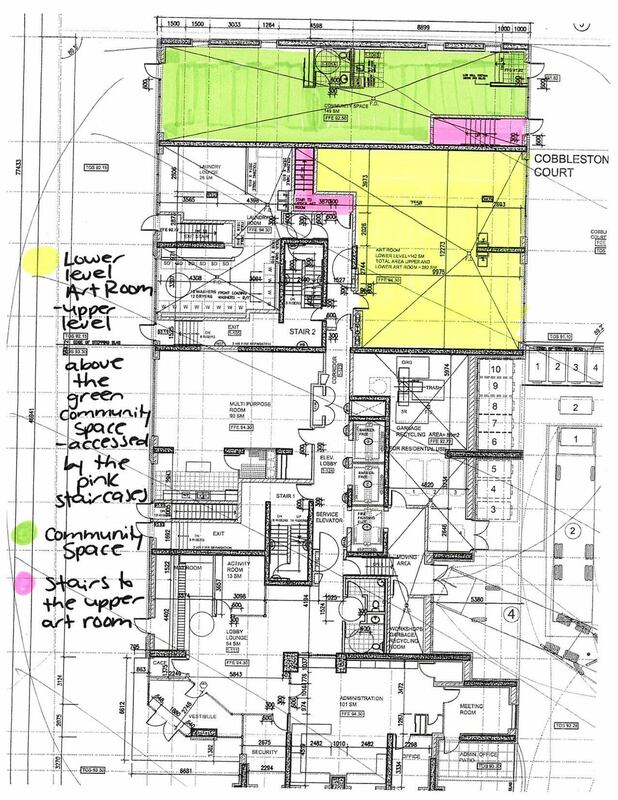 This entry was posted in 180 Sudbury St, Section 37 Information Resources and tagged 180 Sudbury St, Art Room 1, Art Room 2, Community Space, floor plan, Section 37 Agreement, St. Clare's Multifaith Housing on September 7, 2013 by section37org.